Measures 2" x 2 3/8". 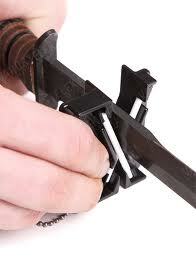 Molded plastic construction with two alumina ceramic sharpening rods for large and small knives. Pocket size with keychain. Sharpens and polishes knives, fish hooks, darts, arrowheads, etc.